Iowa farmland professionals are cautious on near-term land values, based on an annual survey conducted at an Iowa State University (ISU) conference. Farmland realtors, brokers, farm managers and farm lenders attending the 91st Annual ISU Soil Management and Land Valuation Conference expressed their opinions on future land values through the conference’s annual survey. The data was compiled and published by conference organizer Extension Economist Wendong Zhang. ISU has conducted the opinion survey at every conference since 1964. Its results have proven remarkably accurate. Survey participants indicate they expect the average value of an acre of Iowa farmland will slip 1% compared to current levels by November. Looking ahead, they see prices holding steady compared to current levels by November 2019 and edging a slim 2% higher by November of 2020. ISU’s land values survey pegged the average value of an acre of Iowa farmland at $7,326 in November. No update is available for a May benchmark, but other surveys suggest values are steady to 2% higher versus November. The land pros remain optimistic, longterm. They expect prices will rise by 16% by November 2025. They also look for values to increase by 57% by November 2040. The attendees are especially bullish about potential in the southwest quadrant of Iowa. The group calls for a gain of 102% in ave-rage prices by November 2040. The survey participants forecast a rise of 55% in northeast farmland prices and by 57% in southeast values. A 48% gain is forecast for northwest Iowa. 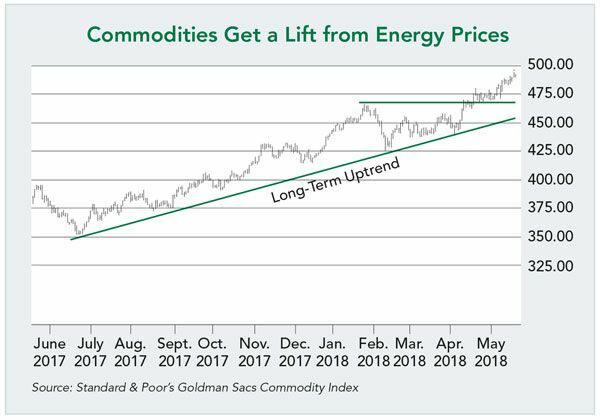 The surge in energy prices is providing spillover support to commodities in general and, by extension, support to farmland prices. The chart above shows the Standard & Poor’s Goldman Sacs Commodity Index. It is a market basket of commodities consisting of metals, softs, grains, livestock and energy. It shows the general uptrend in commodity prices since midsummer of 2017. Except for a small correction in February, the index has marched steadily higher. That correction found support at the November-December consolidation, and then the index moved higher. The resumption of the uptrend formed a more sustainable uptrend and gave the market momentum to push through the high set in January. The index has continued to surge since as crude oil prices have continued to rally. The rise in the index does not signal an imminent rally in grains. But it hints fundamentals and market forces are turning more favorable for prices. That’s good news for demand for farmland. The Pro Farmer Leading Edge Conference will be July 22–23 in Cedar Falls, Iowa. Join us for outlooks on the economy, Washington policy, weather, land, inputs and commodity markets. Go to ProFarmer.com to register or find more details, or call 1-888-698-0487. I hope, for the sake of all land owners, every where (and especially for those that will rush out and now buy Iowa farmland) that this article is correct. But I do not follow the line of thought/optimism? With commodity prices in most categories, crops, LS, including poultry and milk, kind of stuck in a rut(??) and now with rising interest rates, etc. I don't follow the economics of why land continues to move upward in value.....Guess I must be missing something? ?